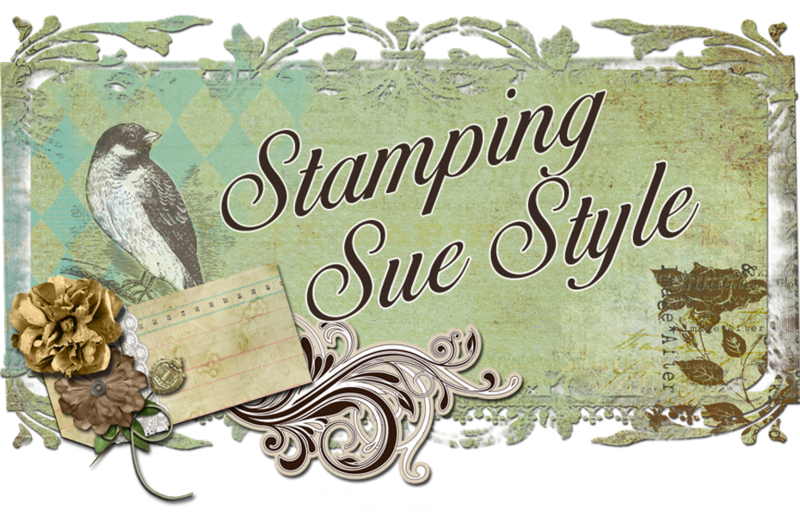 Stamping Sue Style: Time for some Tic Tac Toe ! Hello ! 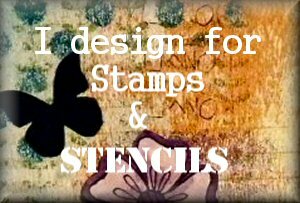 We've reached the start of another month which means we're kicking off a new challenge over at Stamps and Stencils. This time our host is the lovely Toni who has decided we need to play a little Tic Tac Toe. So if you've never come across this before here's what you have to do, pick a line from the below grid either horizontally, vertically or diagonally then create a project including the 3 elements from your chosen line. 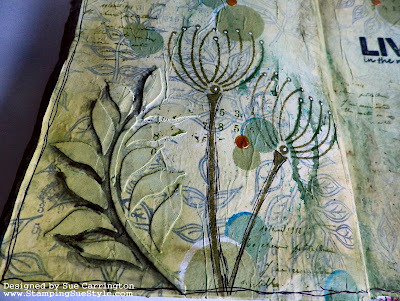 I quite liked all of the elements on the table but had to settle for just one so went with Tissue, Circles and Embossing. I used a Lin Brown stamp and stamped with black Archival over a piece of tissue paper then glued it over the 2 page journal page spread. I then used one of Lin's stencils with some Ranger Texture paste and added the leaves on opposite corners. The stamping was a little too strong so I blended some Fresco Finish paintes over the background. I then stencilled some circles using the bumping technique. I thought I'd got more step x step photos so apologies for jumping to the finished page ! I spritzed the pages with water and spinkled some Infusions over it and held the journal up to let the colours run. I've used another of Lin's stencils and done roughly sketched around the stalks and added some white dots using a Sharpie pen. I used a Stabilo pencil to add extra shading around the embossed leaves. 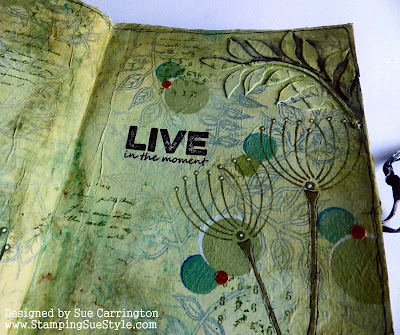 The sentiment is also from one of Lin's stamp sets and is stamped directloy onto the page with black Archival ink. 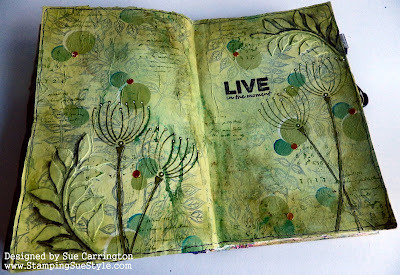 I added some random stamping using 2 PaperArtsy mini's and Fern Green Archival ink. 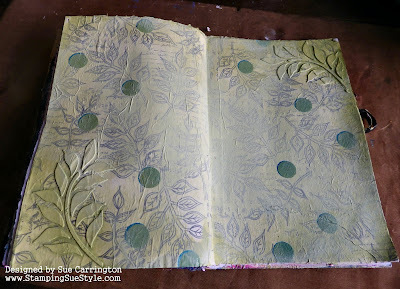 The little gold circles are done using Wendy Vecchi's gold embossing paste and one of Lin's stencils, I put the paste on quite thickly to give to height to them. To frame the final pages I used a fine Sharpie pen and doodled around the edges. It was only when I'd finished that I'd realised I'd gone monochromatic ! 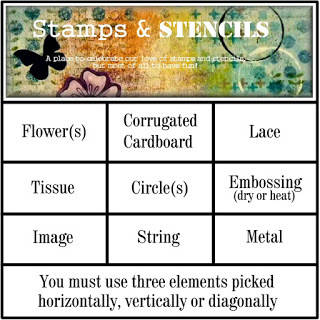 I hope you find some time to join us for this challenge and do make sure you hop over to the Stamps and Stencils blog to see the rest of the DT's fabulous projects. Fabulous page. Love the monochromatic palette but all the stenciling and stamping really grabs me.